Information provided to Conference Room Systems is for internal use only. We can send you a no obligation quote in about one hour. Simply provide the information requested and you will quickly find out what it will cost to purchase a Sound Masking System for your office. If you decide to purchase we will provide you with everything needed to easily install the system yourself or request your local facilities team or general contractor to do the installation. The system is very easy to install and use. 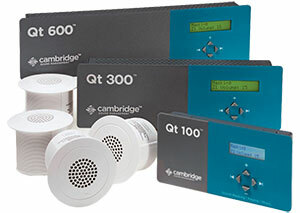 We represent Cambridge Sound Management, the #1 Sound Masking System for Offices. Copyright © 2019 HSI Inc.